› Author Affiliations Funding This work was supported by CSL Behring GmbH (J.P. and H.E. ), the Pfizer ASPIRE Award (J.P.) and the Hans Egli Stipend of the Gesellschaft für Thrombose- und Hämostaseforschung e.V. (L.M.K.). Macrophages make important contributions to inflammation and wound healing. We show here that macrophage polarization is deregulated in haemophilia in response to macrophage colony-stimulating factor (M-CSF) and partially in response to granulocyte-macrophage colony-stimulating factor (GM-CSF). As a result, haemophilia macrophages exhibit a specific impairment of M-CSF-mediated functions involved in wound healing such as clot invasion and phagocytosis. 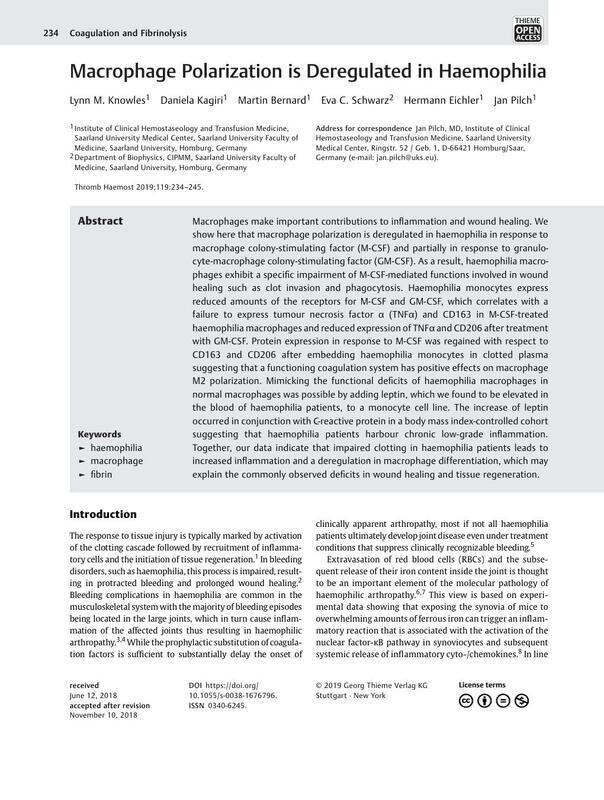 Haemophilia monocytes express reduced amounts of the receptors for M-CSF and GM-CSF, which correlates with a failure to express tumour necrosis factor α (TNFα) and CD163 in M-CSF-treated haemophilia macrophages and reduced expression of TNFα and CD206 after treatment with GM-CSF. Protein expression in response to M-CSF was regained with respect to CD163 and CD206 after embedding haemophilia monocytes in clotted plasma suggesting that a functioning coagulation system has positive effects on macrophage M2 polarization. Mimicking the functional deficits of haemophilia macrophages in normal macrophages was possible by adding leptin, which we found to be elevated in the blood of haemophilia patients, to a monocyte cell line. The increase of leptin occurred in conjunction with C-reactive protein in a body mass index-controlled cohort suggesting that haemophilia patients harbour chronic low-grade inflammation. Together, our data indicate that impaired clotting in haemophilia patients leads to increased inflammation and a deregulation in macrophage differentiation, which may explain the commonly observed deficits in wound healing and tissue regeneration. L.M. Knowles, H. Eichler and J. Pilch designed the research; L.M. Knowles, D. Lessig and M. Bernard performed the experiments; E. Schwarz contributed to methods and reagents; L.M. Knowles and J. Pilch analysed the data; and L.M. Knowles and J. Pilch wrote the manuscript.